Here's a great new game from our friends at NetEnt and its a sure fire winner with a superb Steampunk them and some excellent gameplay features. We think you will love it as much as us. Try some of our UK video slots before the day ends! Better gaming begins with NetEnt, formerly Net Entertainment this developer was originally established in 1996. Growing leaps and bounds over the past 2 decades, NetEnt is now one of the leading digital casinos in existence, with a video slot portfolio containing incredibly original games such as the Fairy-tale Legends series and pop cultural adaptations including Jimi Hendrix online and Dracula. Additional to their plethora of video, NetEnt is also now the producers of NetEnt LIVE, a live and mobile, table-based casino, giving players the chance to experience the excitement and anticipation of Vegas from anywhere in the world. Have some fun when you try our slots games today. Welcome to an alternative variation on Victorian London. Set on cobbled streets surrounded with impeccable graphics, from the 3D protagonist to the details within each symbol upon the wheel. The 19th century has never looked so polished. The adventure themed slot holds 5-reels and 15 active pay-lines along with Stacked Wilds and a Scatter triggered Free Spin rounds. Before playing the game, discover more top slots when you check out our list. 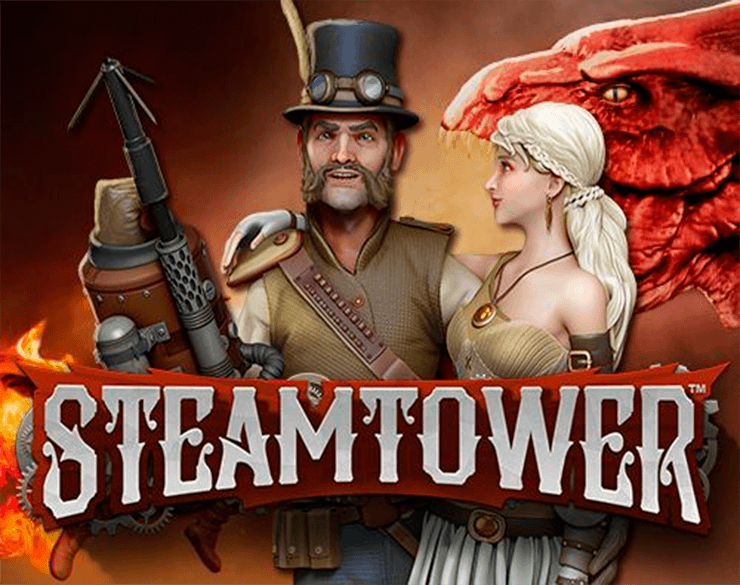 The Steam Tower depicts the theme of steampunk extremely well, steampunk as a genre tends to reinvent or interoperate the past with the addition of steam powered inventions – often inspired by modern day gadgets. Complete with steampunk attire, the protagonist is holding his own fantasy based harpoon – a totem also found within the reel. Along with the harpoon players will also find the Dragons Eye, Protagonist, Princess, Steam Tower and a range of Poker themed symbols – J, Q, K and A – all reinvented in this 19th century, industrial design. As far as story lines go, this game follows the classic fairy tale, damsel in distress scenario. Taking control of the protagonist players must climb Steam Tower, defeat the Dragon whilst rescuing the Princess. The weapon of choice (the Harpoon) in the reel acts as a wild, a symbol that can be used to substitute for any other none-bonus symbol, helping to provide players with a winning payline. An additional Stacked Wild can also appear within the reel and finding more than one will trigger the Free Spin feature whilst ascending to the next floor of the tower. With each new floor found during the Free Spins comes a new multiplier for a maximum of x7 on floor 16, where the Princess is being held captive – so free your damsel and bask in the newly found jackpot. Before embarking on this journey players must first set their bets, well suited to all comfortabilities the combination of Bet Level and Coin Value can change the wager drastically. With a minimum spend of £0.15 per spin players still, have the chance to win a reasonable amount per round. If both the betting level and coin value are at their fullest potential players will be spending £150.00 per spin but the potential winning totals will rise drastically to coincide with this sizeable wager. 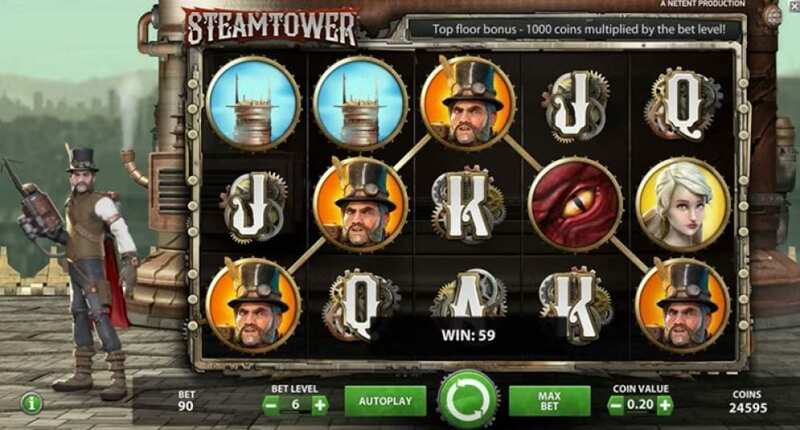 Adventure slots always contain a fair amount of re-play value and Steam Tower is no different. Taking an almost masculine style to a fairy tale format allows for a new take on an old story. The stunning graphic work inspired by the Victorian industrial age leave players with so much to look at as they begin their assent to save the gorgeous princess.